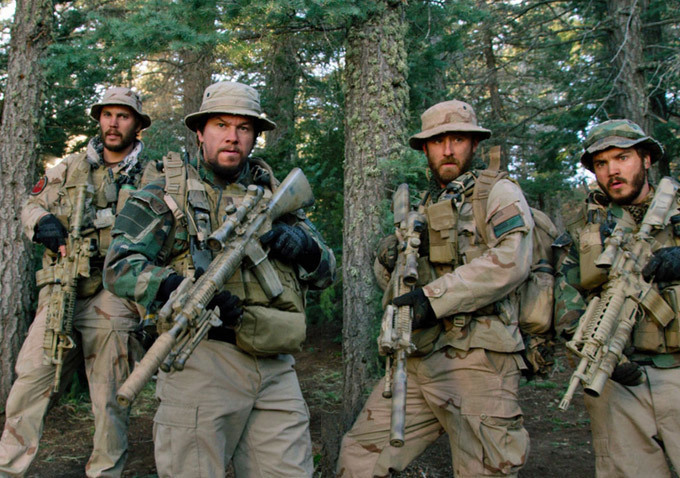 Taylor Kitsch (far left) as Lt. Michael Murphy. Photo via imdb.com. Hollywood hero: The story of Lt. Michael Murphy ’98 has gotten the big-screen treatment before—in the documentary Murph: The Protector. But now Hollywood is offering its own version. Lone Survivor, which hits theaters Jan. 10, tells the story of “Operation Red Wing” and the three Navy SEALS, including Murphy, who were killed in the mission. Taylor Kitsch (of Friday Night Lights) plays Murphy, and Marc Wahlberg (of the Funky Bunch) plays Marcus Luttrell, the only SEAL to survive. Check out the trailer here. Blue Christmas: And because Clark Griswold-style holiday decor never gets old, today’s Onward State features another Penn State-themed light show, this one from Sally Simpson, mom of Blue Band prez Ryan Simpson. Impressive, to say the least. Entry filed under: Uncategorized. Tags: Aaron Ramos, John Urschel, Lt. Michael Murphy.